The Autism Research Team (ART) have been conducting an exciting new MIRAGE project funded by the British Academy/Leverhulme small grant scheme. The team investigated whether children with and without autism spectrum disorders (ASD) respond to multisensory illusions in the same way and whether susceptibility to illusions changes with age. MIRAGE illusions rely on multisensory integration which is important not only for allowing us to perform simple movements (e.g. pointing) but also for developmental processes. These include distinguishing between the self and others, and developing a sense of body ownership. Such processes are necessary for the development of more complex social behaviours, including empathy and imitation, which individuals with ASD have difficulties with. Research exploring multisensory integration in ASD could give us a better understanding of the social problems in autism and how these could be remediated. 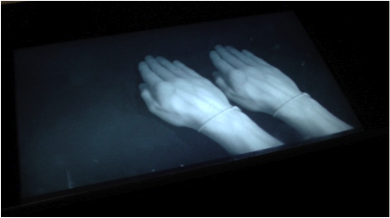 Participants aged between 5 and 15 years placed their right hand into the MIRAGE system and saw two images of their right hand on the screen (the supernumerary limb illusion). One image was always in the same location as the real hand while the other was to the right or left of the real hand. Children felt their hand being stroked with a paintbrush and saw one hand being stroked in time with the felt strokes, while the strokes on the other hand were delayed. A picture then appeared above each hand and children were asked which picture was above their real hand. In past experiments, adults nearly always state that the hand being stroked in time with the felt strokes (the synchronous hand) is the real one, even when this image is not in the same location as their actual hand. This is due to the adults integrating the visual and tactile information, creating a strong sense of ownership over the synchronous hand. In the current experiment, children aged between nine and 11 years showed similar results to adults, as did seven and eight year olds, but less strongly than the older children. Interestingly, four to six year olds did not chose the synchronous hand significantly more often than the asynchronous one. This suggests that the multisensory integration necessary for this illusion to occur develops throughout childhood. Overall, children with ASD tended to choose the synchronous hand. This is in contrast to previous research which has suggested that individuals with ASD may be less susceptible to multisensory illusions such as the rubber hand illusion (RHI). In the RHI, ownership of a fake hand is induced by providing temporally congruent seen and felt touches on a fake hand and the participant’s real, hidden hand respectively. These contrasting findings could be due to the MIRAGE illusion requiring less language comprehension, attention and imagination than the RHI. To investigate this, further MIRAGE experiments are being conducted as part of a PhD by Katie Greenfield, a member of the ART, with a larger number of individuals with Autism.